Well, it’s Monday again. But can you believe that there’s only TWO more Mondays left in 2016?? Where did the year go?? And this weekend was WAY too short but I made the most out of it even though it was the coldest weekend we’ve had this season. It even snowed for a bit last night…yay! Did you catch my snap of the snow on Insta Stories? Dexter was having no part of it (he hates the rain too) so I played in the snow by myself after a quick Starbucks run. I needed a little extra caffeine after my brunch-induced food coma to stay up and watch the Warriors game and finish writing this blog post. But that waffle was on point so I regret nothing. Anyways, back to the REAL reason why we’re here: this outfit. And yes, you’re seeing things correctly: I am indeed wearing shorts. But more on that later. The main focus of this outfit in my opinion is this purple masterpiece of a wool coat. Isn’t she a beauty? Swoon! I’ve owned this coat for about 5 years. I bought it at Express during one of their outerwear sales. I instantly fell in love with the color and the leopard print lining definitely gave it bonus points. Since I do wear mostly neutrals, I like to add pops of color or print with my accessories and coats. It’s a great way to add color to your wardrobe without feeling like you’re stuck with a colored top that maybe isn’t as versatile. If you’re looking for a great wool coat without breaking the bank (their wool coats are usually under $200) then I highly recommend Express. 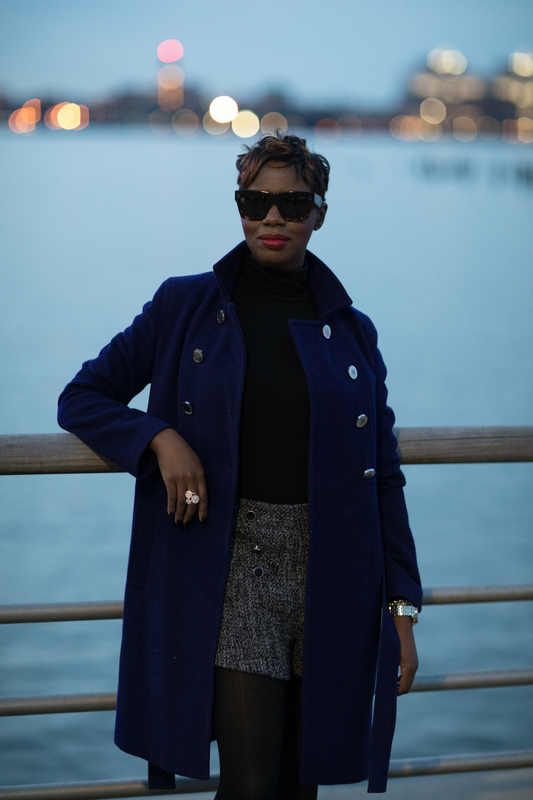 I own one other wool coat from them that will probably make an appearance on the blog before the season is over. You’re also more likely to not see the SAME coat on everyone and their mother and their brother like you would if you maybe bought a coat from H&M or Zara. 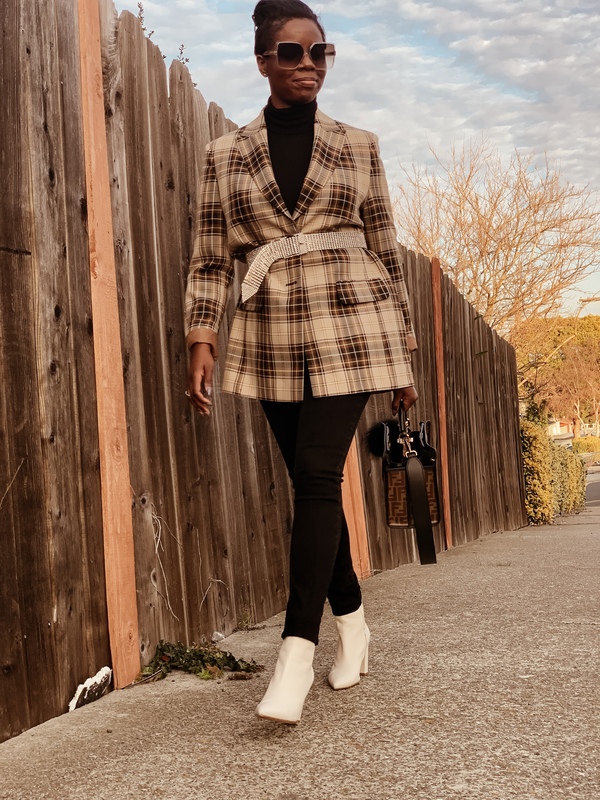 And I know you’re thinking that I just contradicted myself because I talked about an H&M wool coat that I bought and am obsessed with in one of my most recent posts. But what I AM saying is that you’re less likely to see someone else in the exact same coat if you’re willing to shop off of the beaten path a bit. These shorts were a fab Forever 21 find from 2 years ago that I found while I was going through my closet back home in California over the Thanksgiving holiday. I love boucle as much as I love herringbone and houndstooth. The high waist and button detail is what truly sold me on them though. I did wear these to the office back when I first bought them with tights and ankle booties but I had a little bit more flexibility with my wardrobe at that job than I do at my current job. I personally love shorts at the office but only wear them if your office allows them. And if you can’t do a true pair of shorts, try culottes or Bermuda shorts instead which are more conservative options. I opted to wear one of my turtleneck bodysuits from ASOS for a seamless look but any turtleneck will work just fine. Or for a more fun look, throw on a graphic pullover with a collared shirt underneath and leave the collared shirt un-tucked or do a half-tuck for a more casual vibe. Simplicity is the ultimate form of sophistication in my opinion and I wanted this purple coat to do all of the talking with this outfit. I kept my accessories minimal with my every day jewelry and signature red lip and Celine sunnies. And remember in last week’s post how I mentioned that I was grateful that I had to pack tights which saved me from looking like a hooch? This outfit was why I packed them. These are actually fleece-lined tights which make them extra warm and I love them. I bought them at Urban Outfitters last winter so that I had “thermals” on days where I wore dresses with boots or my jeans were too tight to wear traditional thermal underwear underneath them. They were definitely worth the money. And you may not be able to see them up close but I’m wearing my Chanel slingbacks with this look. If you can get your hands on a pair, they’re definitely worth the investment. I’ve worn them with everything from overalls and a chambray shirt to an oversized knit and pencil skirt. And they’re extremely comfortable too! There’s a close-up of them in the box from the day I brought them home on Instagram if you want a more detailed look. I’ll definitely be doing more posts on them in the Spring and Summer so stay tuned! I love the way you’re thinking here! 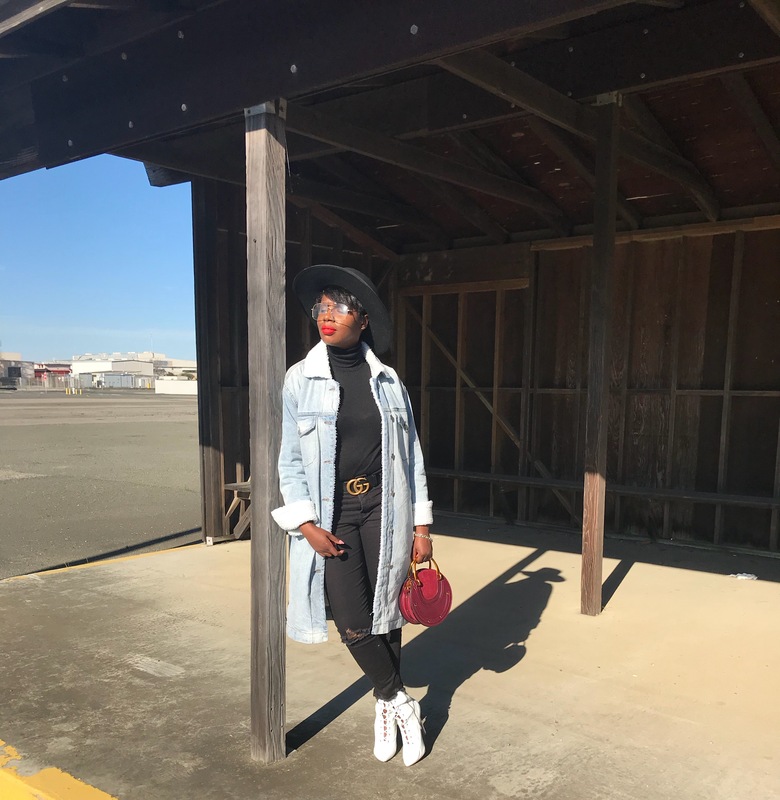 I adore the fact that you not only reuse items, but make them look fabulous five years later and in this blogging business, you’ve always got to have the newest outfits and follow trends and what not, but guess what? You don’t and you just proved that as you look amazing! GORGEOUS coat!! I love that color.